It is now clear that the recent visit of the Deputy Crown Prince and Saudi Arabia’s Minister of Defence Mohammad bin Salman and the Crown Prince of Abu Dhabi Mohammed bin Zayed Al Nahyan to Russia to meet Russia’s President Vladimir Putin led to no consensus on the Syrian conflict. It was reported that both Arabian emissaries stated that they would not allow the destruction of their radical opposition groups such as Jabhat al-Nusra, Ahrar ash-Sham and Jaysh al-Islam, therefore they would be providing military aid to these terrorists groups openly, which will include MANPADS that can allegedly pose a threat to Russian aircraft operating in Syria. Moreover, Riyadh and Abu Dhabi will continue their efforts in disrupting any reconciliation efforts within Syria as long as Bashar al-Assad stays in power. It was made clear that Saudi Arabia and the United Arab Emirates perceive the strengthening military-political alliance between Russia and Iran as a serious threat to their national security, due to the fact that this alliance is capable of seriously changing the balance of power in the region, especially in light of the extremely poor military capabilities of the Arabian monarchies. The attempt by the KSA and the UAE to begin supplying the rebels with modern MANPADS, by purchasing Stingers in Afghanistan and Strelas in Libya, have already been made public. It is unlikely that Washington understands the potential danger that this step can present to its own aircraft, as today US coalition warplanes are still allegedly fighting terrorism in Syria. On top of that, there’s reports that a total of 500 TOW weapons systems are going to be supplied to Jabhat al-Nusra by Saudi Arabia. Thus, Riyadh has clearly made clear its standing in the Syrian conflict. One can clearly expect that Saudi Arabia will launch new terrorist attacks deep within Russian territory by resuming the funding of radical organizations in the Russian Federation. One can also expect attempts to launch an Islamist uprising in the North Caucasus, particularly in Dagestan. It’s hardly a coincidence that the recent fatwa drafted by 52 religious scholars and imams from Saudi Arabia called for a widespread jihad against Russia. In addition, Riyadh is persistently trying to convince Ankara to introduce a 100 kilometers deep no-fly zone over northern Syria under the pretext of carrying out a humanitarian operation to protect refugees. Turkey would have been happy to do so, but a lot depends on the position of the US and NATO, who clearly do not want to provoke a confrontation with Russian warplanes stationed in Latakia. 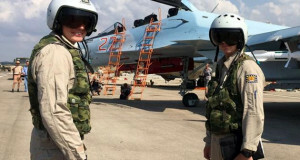 But the Turks these days are aggressive to the point of making claims that are ready to shoot down Russian combat aircraft, while Erdogan has been making threats that he would stop buying Russian gas. There’s no way that Ankara doesn’t understand that the US coalition is not going to concede to Russia the position of being the leading anti-terrorist fighter in the world, therefore a widespread offensive of Kurdish forces is going to be launched by Washington in northeastern Syria soon. To implement this plan, Washington has even dropped 50 tons of weapons to Kurdish troops, which is clearly a sign of the forthcoming large-scale offensive against the Islamic State capital in Syria – the city of Raqqa. The capture of this city would not only interrupt the financial flows of ISIL in Syria and Iraq, but also will constitute the beginning of the creation of a Kurdish buffer zone, which will interrupt the flow of weapons and reinforcements that the Islamic State is getting from Turkey. Therefore, the supply lines will run through a “security zone”, which has been informally created by the Turkish military on the border. Of course, Moscow and Washington’s positions remain deeply divided over Syria. Americans even resorted to a rather undiplomatic move when they refused to accept a Russian delegation led by Prime Minister Dmitry Medvedev which was going to discuss practical steps to coordinate joint actions over the fight against the Islamic State. It seems that it was obvious for both states after the meeting between Vladimir Putin and Barack Obama in New York, that there will be no formal international coalition between the US and Russia. We must not forget that Washington keeps applying pressure on Moscow regarding the Ukrainian question and vehemently opposes the abolition of ongoing sanctions. In this context any steps to create a formal coalition with the United States would mean a sign of weakness and inconsistency, which is unacceptable for Barack Obama against the backdrop of his failed Middle Eastern policy – failures that began with the Arab Spring itself. There are serious differences over a number of questions between the US and Russia, including the fate of the Syrian President Bashar al-Assad. Americans are lost in an attempt to find a suitable opposition force in Syria that could be used as a basis for the creation of a comprehensive anti-Assad and anti-Islamist coalition. At some point Washington tried to create such a force in the form of the Free Syrian Army, but then they themselves refused to support it. Then attempts were made to dissect a segment of moderate Islamist forces, which could be reinforced by militants trained in Turkey. This allowed Washington, with an extensive amount of interference by the Jordanian secret services, to create the Ahrar ash-Sham and Jaysh al-Islam groups. But only an incredibly naive person would believe that the US operation of preparing “a new Syrian opposition”, that then allegedly defected to Islamists, failed as miserably as it did. This was nothing more than a routine cover-up operation for the transfer of weapons and fighters to pro-Saudi Islamist groups. And even if it was frozen due to Congressional hearings, it doesn’t mean that it has been terminated. It only means that weapons and ammunition will now be supplied through Saudi Arabia and Turkey directly. But there should be no doubt, an operation with a total cost of 500 million dollars was carried out successfully. At the same time, Americans have seriously intensified their cooperation with the Kurds, who are now considered the most important allies of the US in Syria. The upcoming Kurdish offensive will seriously jeopardize bilateral relations between Washington with Ankara, but the US has no choice there. The US in desperate need of military success, and besides the Kurds, no one can bring it to them. There’s no way the White House will support Jabhat al-Nusra openly, since it can be found on the official US State Department list of foreign terrorist organizations. Moscow is betting on the legitimate Syrian leader, President Bashar al-Assad and the forces that depend on him in order to ensure their physical survival (the Alawites, Druze, Christians, Circassians, Armenians, and some Sunnis), which makes this alliance more promising and viable than all the untenable American projects put together. Additionally this kind of alliance allows Russia to operate much more effectively and cost-efficiently than the United States and its allies. All other concerns are put aside until better times, especially in times when ISIL militants are fleeing their positions in Syria in an attempt to hide from Russian bombs in Turkey and Iraq, while the advancement of the Syrian army successfully relieves those areas that have been controlled by Islamists in the west and northwest of the country. Another sign of a major Russian success in Syria is the fact that terrorist groups began leaving the suburbs of Damascus. Aleksander Orlov, a political scientist, expert-orientalist, exclusively for the online magazine “New Eastern Outlook“.